First I started by making a simple draft and transferring it to an old and used up formwork plywood. I cut leftover beam parts from previous projects into blocks and attached them onto plywood boards along the line using four screws by block. Spacing between blocks is approximately 10 cm. Everything is sprayed with anti stick solution to prevent gluing to the mold. 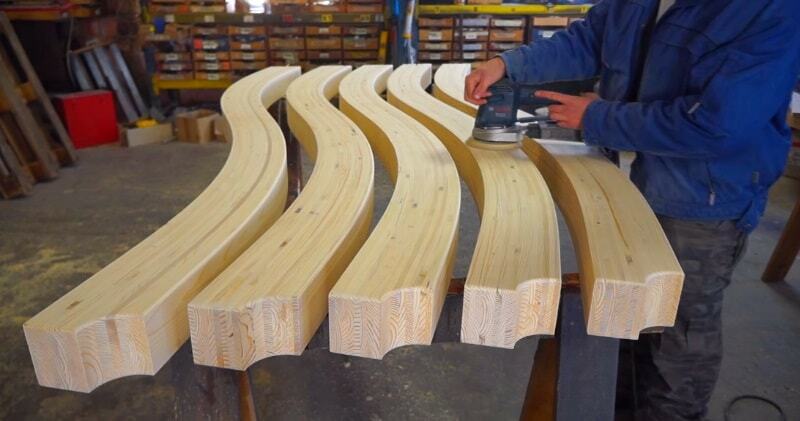 Wood used in this project is spruce, planed to 9 mm which is required thickness for this radius of curve. After cutting to length, two component melamine glue is applied on each layer.Whole bundle is then clamped and left to dry over night. after removing from the mold, beams are planed to remove excess glue and to achieve desired thickness. Edges are rounded using a router with a roundover bit. Everything is sanded using first a belt sander with 120 grit sandpaper followed by orbital sander with 180 and 240 grit sandpaper. Finally, wood is protected with three coats of stain.